If you’re printing a flyer, you might be printing 4/4, which essentially means you are printing four color on the front and four color on the back. If nothing’s on the back, then it would be 4/0. For postcards, you might print 4/1: four color on the front and 1 spot color on the back. For business cards, you might print 2/2: 2 spot colors on the front and back. 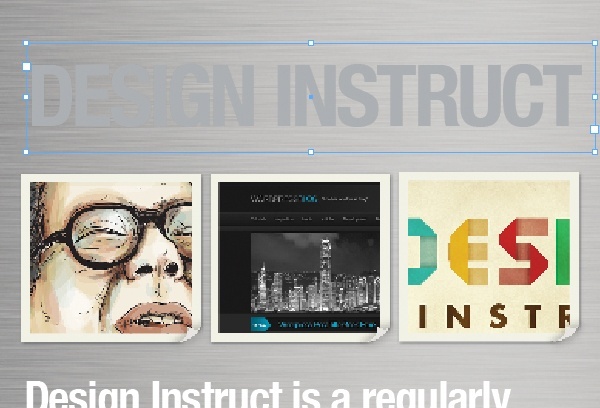 Here is a diagram of a typical document for print designs. Trim Line: This is the finished size of the piece. Live Area: The area that is considered safe to keep any important information within. For example, if an ad’s trim size is 8.25 in × 10.25 in, the live area might be 7.75 in × 9.75 in. This takes into consideration the binding if the ad is placed on the left or right of a spread and you don’t want copy to be unreadable if it is too close to the spine. Bleed Area: The more bleed you can offer, the better.The minimum bleed you need for a printed piece is 0.125 in (1/8 in) but some specs require more than that. 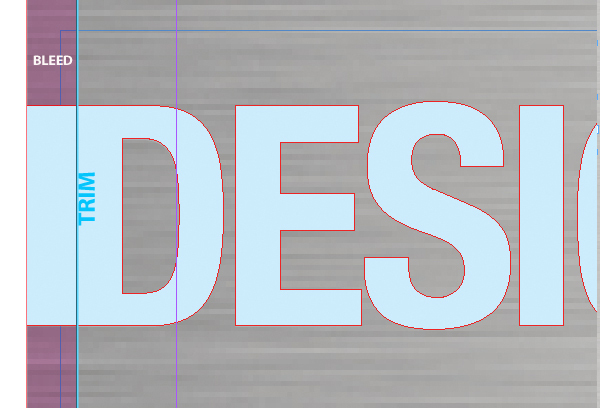 So if you are working with an image in Photoshop and you’re placing it in InDesign for print preparation, keep in mind the area you might need to use for the bleed. Crop Marks: Indicates where to cut the paper. When printing with black color, there are two types of black you can use. Note: Rich/Packed black specifications may differ from printer to printer, so you should ask your printer what they recommend. Below, you will see the difference between rich black and black. It may be hard to tell the difference when preparing files on your monitor screen depending on your monitor type and monitor calibration since PC screens show richer colors in RGB. Therefore, it is wise to get a press proof when printing blocks of black. Here is a sample of a flyer using the 2 blacks. The live area is denoted in green and the dashed, pink line is the trim area. 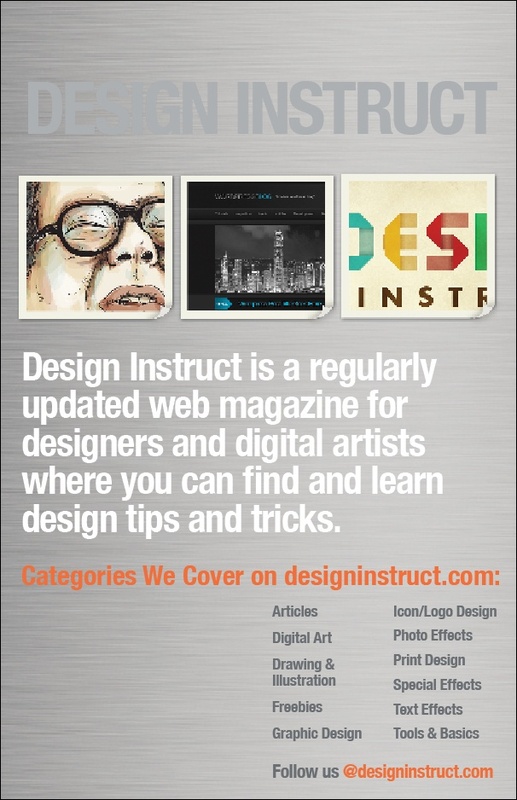 Download the InDesign template for the flyer above. If you decide to use a UV varnish/UV coating on your printed piece, all you need to do is select the image or text you want the varnish on. To keep your work organized, I’d suggest creating a layer and a spot color named “varnish/spot” and then make sure this spot color you create is not already used in the file. Here is a piece without a UV varnish layer. 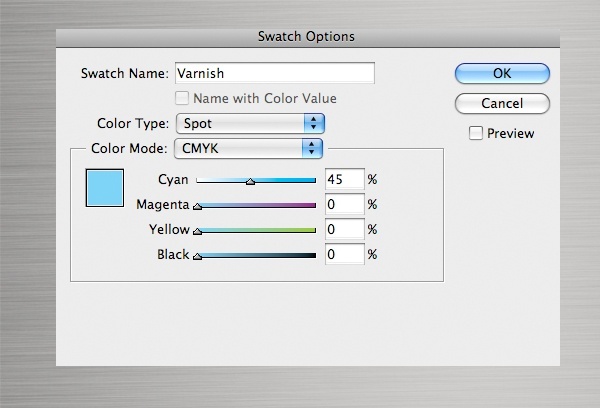 First, create your spot color in your Swatch Panel. Then select the image/s and text block/s you want to apply the UV coating on. Add a new layer, duplicate the elements (Ctrl/Cmd + J), and then apply the spot color to the elements on that new layer. 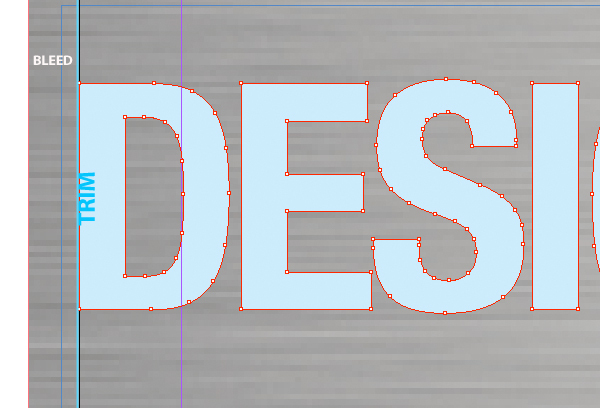 If you haves a design that has type that’s flush with the trim, one suggestion is to rasterize the type and pull the paths out beyond the bleed. Here is some text that’s flush to the bleed line on the left. Here, we extend the letter “D” to the bleed area so that we can ensure that the text is going to be printed right at the edge when the piece is trimmed by the printer. If we don’t extend it into the bleed area, the text might have a gap at the edge of the printed material. 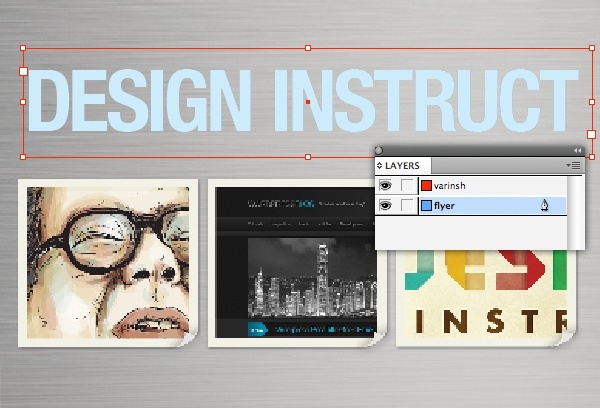 Download the InDesign template for the UV varnish/UV coating piece above. If you need more vibrant colors or exact color matching (e.g. for consistent company branding) than what CMYK inks produce, spot colors/PMS colors is the way to go. 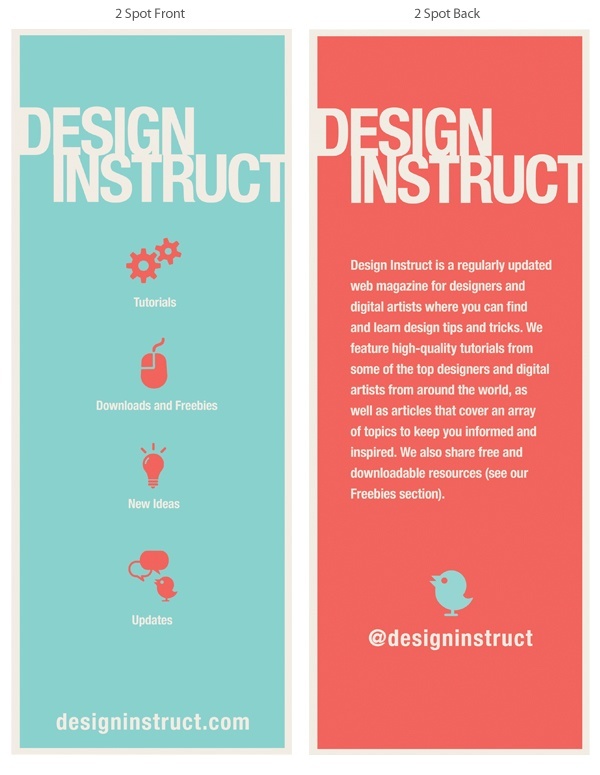 Here is a sample of using 2 spot colors in InDesign (the design is 2/2). 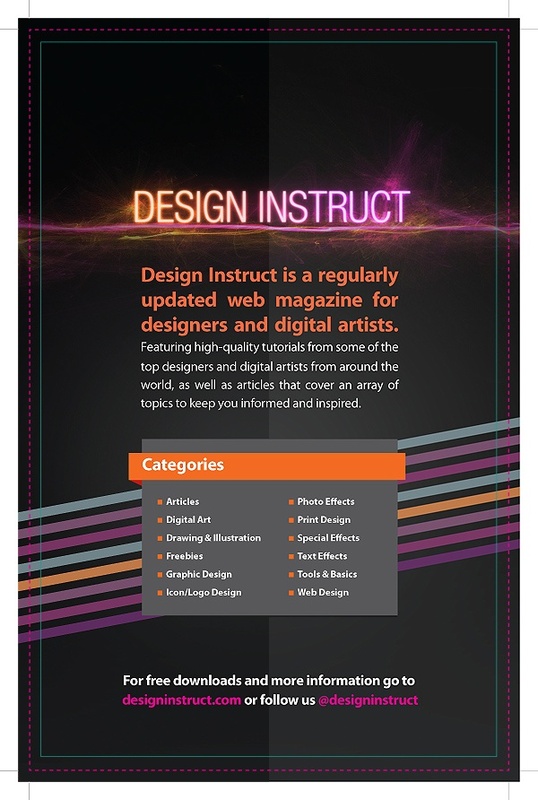 Download the InDesign template for the 2-spot color flyer above. 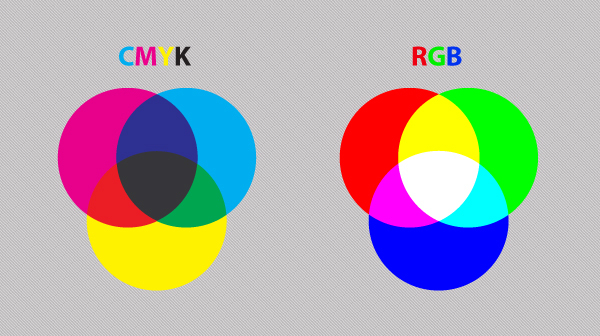 If you are doing spot colors in Photoshop, make sure all objects and type that are in the same color are merged on the same layer and named with the spot color they should be printed in so it is clear to the printer. Also, provide a layered PSD or TIFF file and rasterize your type and vector layers. This can also be applied to files set up in Illustrator. 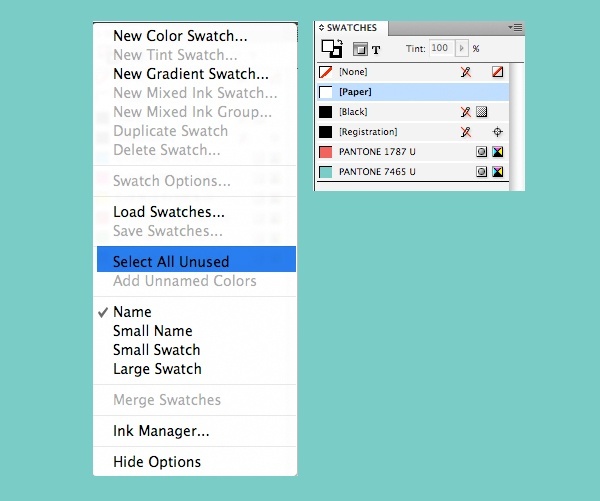 Additionally, remove any unused colors before packaging file. 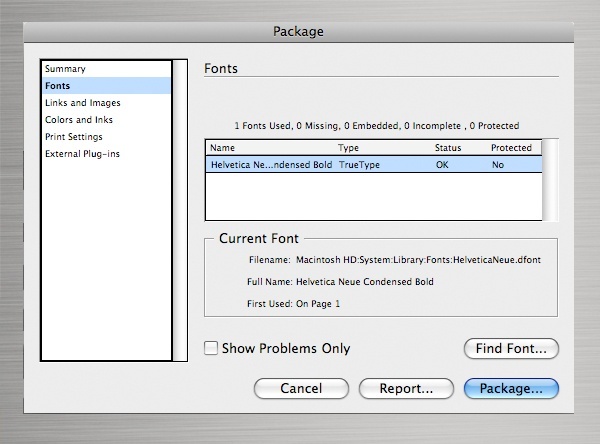 In CS4, collecting files is known as Packaging (in previous versions it was known as Preflight). 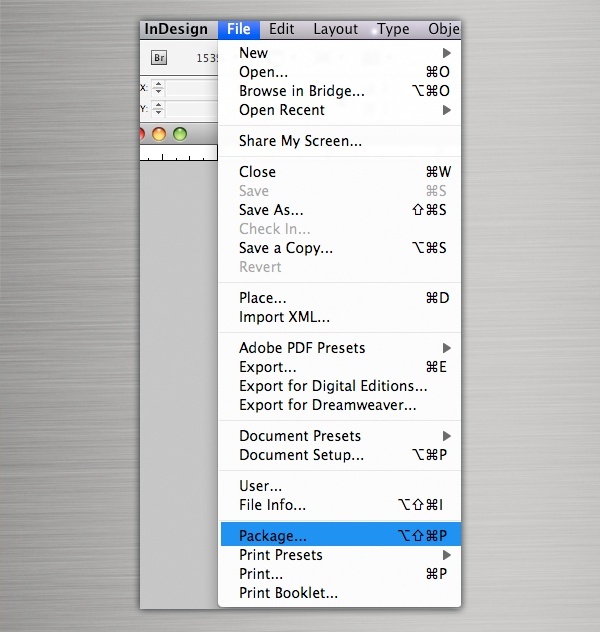 To collect and package your files in InDesign, go to File > Package. A summary screen will pop up. 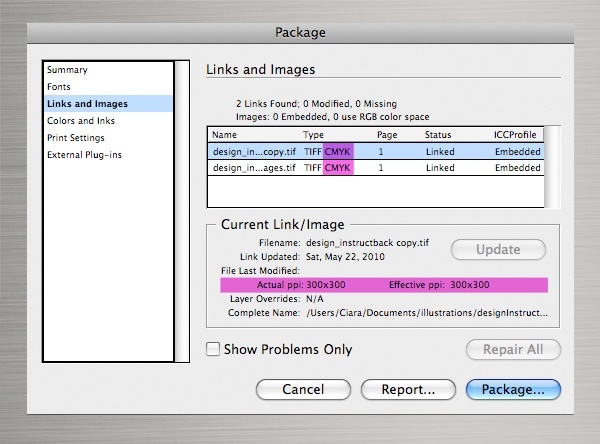 Here, you will see any spot colors used, RGB images, image sizes and fonts in the file. On the image below, you will see that there is 1 font used, 2 linked images, no RGB images, 4 color process and 1 spot color. For a more detailed overview of each component, click through the navigation menu on the left side of the Package window. It is good practice to check these. Check the font/s you used in the document in case you need to remove anything saved on the pasteboard. 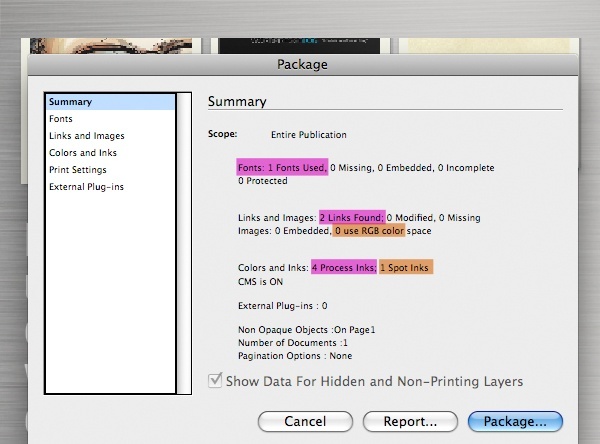 In the Links and Images section, you can see the file type is a TIFF with CMYK value at 300 ppi. If you only want to see errors such as RBG linked files, check the Show Problems Only option. If everything looks good, hit the Package button. When collecting the native files for the packaged folder, make sure the links below are clicked on.